If you're like most travelers, protecting your jewelry isn't top-of-mind on your travel prep to-do list. But there are some precautions to take, especially if you bring your engagement ring or other expensive pieces. Where are you going? What will you be doing while you're there? If you're jet-setting for a laid-back beach vacation, maybe you can get away with no jewelry at all. Or just a few casual pieces for a nice dinner out. But if you're traveling for work, or a destination wedding, jewelry could be on the must-have list. If you decide you need jewelry along, check for any travel advisories for your destination. If crime is of concern, consider leaving your fine jewelry behind. How should I store the jewelry I'm leaving behind? Don't forget to take precautions for the expensive jewelry you leave behind. Just because it's back home doesn't mean it's 100% safe. If you can, consider renting a safety deposit box to store your valuables while you're away. Even though the government protects the money you store at a FDIC-insured bank, belongings in a safety deposit box are not included. They still need insurance! If that's not an option, your best storage locations at home are a safe, ideally, or an inconspicuous location if you don't have a safe. Contrary to popular belief, your jewelry box is not where you should store expensive jewelry! Where do you think a thief is going to look first? There are so many things to think about while traveling - expensive, sentimental jewelry doesn't need to be one of them. Simple, versatile costume jewelry does the trick in a variety of vacation situations. But, did you know jewelry intended for travel is actually a thing? It's called travel jewelry and it's the jewelry industry's best-kept secret. Look for travel jewelry specialists like Lanciani Travel Jewelry and Jennifer Miller Jewelry to keep you looking high-class for a low-end price tag. Should I wear a fake engagement ring on vacation? For many people, the most expensive piece of jewelry you own is your engagement ring. And you probably don't take it off very often. I know even I'm guilty of wearing my engagement ring as normal on vacation. But should we? Depending on where you're going and what you'll be up to, the answer could very well be no. We'd actually recommend the best of both worlds - a fake engagement ring for dressing up and a silicone ring for messy or risky activities. When packing your jewelry for travel, you want to avoid loss, damage, and unwanted attention. Of course, you can buy products made to protect jewelry during travel. There are tons of jewelry rolls, travel cases and pouches on the market. 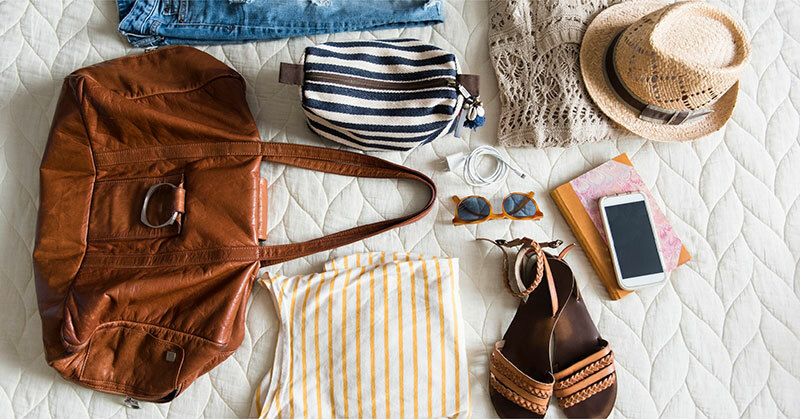 Check out even more DIY tips and tricks from our friends at Travel Fashion Girl. Can you bring jewelry in a carry on bag? Absolutely. In fact, if you're not actually wearing your more expensive pieces through the airport, your carry-on is the only other way to go. Make sure to keep the bag with your jewelry inside in your sight at all times. That includes offers of help from airport staff, cab drivers, bellhops and the like. Never, never, never pack your fine jewelry in checked luggage. There's just way too much risk. Can you wear jewelry through airport security? Yes. In fact, TSA encourages you to keep your jewelry on. The vast majority of jewelry will not set off the alarms, and if it does an officer can inspect it with you watching. If you do decide to remove your jewelry for whatever reason, put it into your carry-on bag, not on its own in a bin or bowl. While most of the above applies to pretty much any jewelry you care about, there are extra tips to consider for traveling with expensive jewelry. 2. Alert officials, if necessary. If your insurance company requires you to notify them of travel, make sure to do so. Also don't forget that, for international travel, you must report to Customs the transport of goods valued at $10,000 or more. 3. Know when not to wear your jewelry. While your valuables are often safest while in your sight, there are activities during which you need to take your jewelry off. Look over our full list of activities that should be off-limits to jewelry. 4. Store safely at your hotel. Never leave your jewelry out in your hotel room, even inside your luggage. For any expensive jewelry you're not wearing, ask the hotel staff if they have a safe you can use, whether in your room or behind the desk. 5. Conceal, don't reveal. Especially if you're in a more dangerous or unknown area, take steps to conceal any expensive jewelry from strangers. Also, don't advertise the presence of expensive jewelry by sharing to social media. There's no need to make yourself a target. 6. Appraise and insure. Is your jewelry insured? Does your insurance cover worldwide travel? Or do you have travel insurance that covers jewelry? Make sure you know the limitations of your policy, and that you're covered for full value for the most common causes of loss. It's also smart to update any appraisals before you leave. Bringing jewelry with you on vacation is one thing. Buying new jewelry while traveling is another. Make sure to check up on the business. You don't want to be told you're getting one thing, just to get home and have it appraised as something else entirely. If you can, stick with well-known brands. As long as it's not a knock-off, a popular brand name is a safer bet than a supposedly "exclusive" line. Read the fine print. As always, make sure you're not signing on to something you don't intend to. It's also ideal if you can ship an item back to return it if needed. In payment and in taxes, mind your money. Pay with a credit card for extra protection and make sure to check on any potential import taxes. For more, read The Smart Traveler's Guide to Buying Jewelry on Vacation. All jewelry loss is devastating. Losing jewelry while traveling is extra heartbreaking since the chances of it turning up down the road are very slim. If, despite all your precautions, your jewelry is lost or stolen on vacation, all hope is not lost. If you suspect theft, notify security wherever it occurred - the airport, hotel/resort or cruise ship. Then, file a formal police report with local authorities. Did your jewelry get misplaced? Follow our checklist to cover all the bases to find it again. Whether lost or stolen, this is where jewelry insurance becomes vitally important. If you take one thing away from this guide, insure your expensive jewelry. That way, if all else fails, you're protected with a solid backup plan to repair or replace your pieces.